I've never really done this sort of thing before. As I mentioned in the last post, I usually like to work in a little more free form way. It is a learning experience. I thought I'd show a little more of my process and progress. 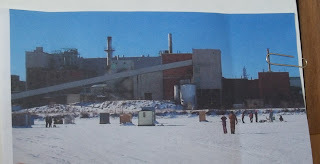 This is my way to commemorate the place where my husband and his father both worked. 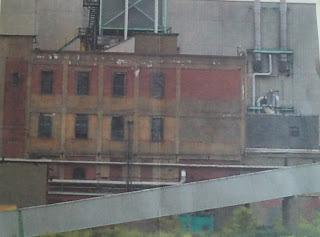 First, I started with several pictures of the mill which is now in the final stages of being torn down. 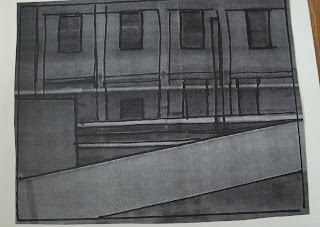 I used a rectangular viewfinder to zero in on certain areas that interested me with both color and design elements. 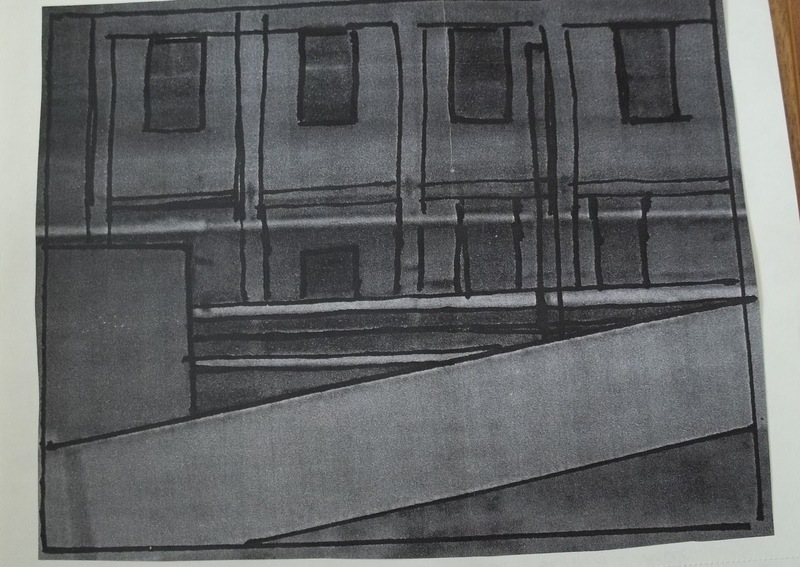 Once I chose a section, I took it to the copier and enlarged it to the approximate desired finished size. Then I simplified the drawing somewhat by tracing with a black pen around the important elements and transferred it to tracing paper. From there I've started to make(with a little help form a friend) paper piecing patterns for each section. Today, I made a couple more and got them sewn together. 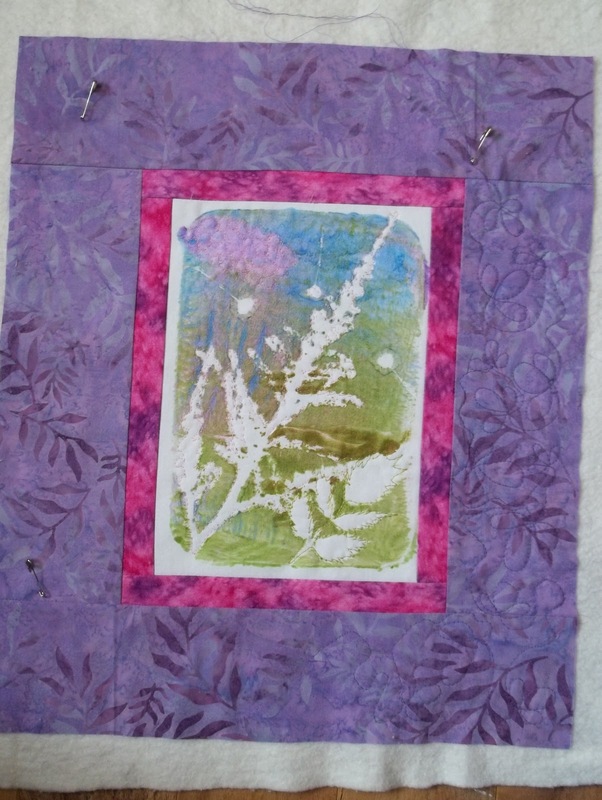 The finished size should be somewhere between 8 by 10 and 10 by 12 inches , but I may mount it on a larger canvas. It doesn't look like much, but it really is quite an achievement for me! I've been a little lax lately in writing-- a combination of health issues and appointments. I won't get into details except to say that I have been dealing with these specific health problems for just over a year and I've not gotten very far. The medical system is a slow machine. The endocrine system is complicated and the family doctor is overwhelmed. I have an appointment booked only for November 2011 with a new endocrinologist. I called to see if they had a cancellation list and they don't, so I have to wait. 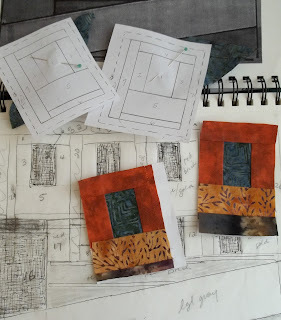 When I have the energy,I have started working on a little project I've been wanting to do for the last 5 years since our local paper mill closed. 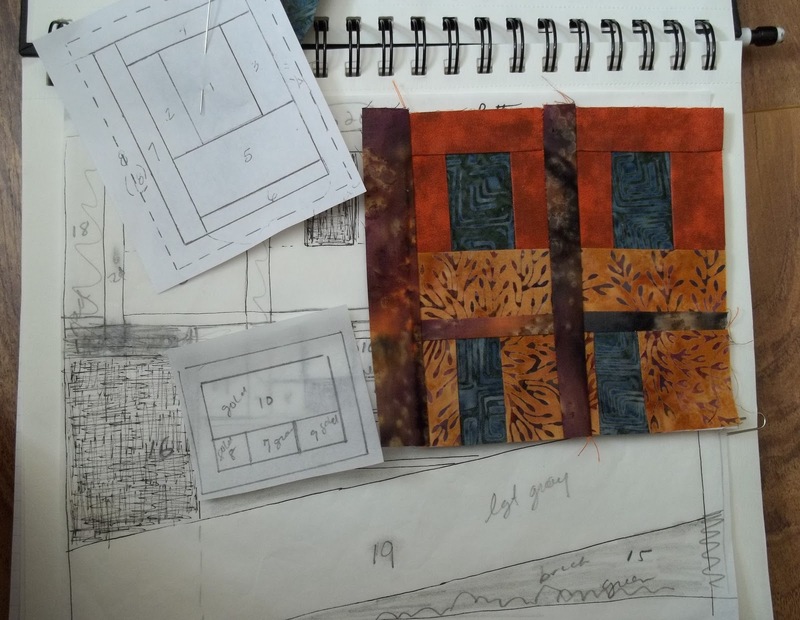 It's a bit of a departure for me because it involves pre-planning and drawing up a pattern for paper piecing. My process is usually a little more laid back, kind of a let's see where it goes sort of thing.. While I'm fairly experienced at paper piecing, I have problems doing the patterns. My friend, Glenda helped me with that. 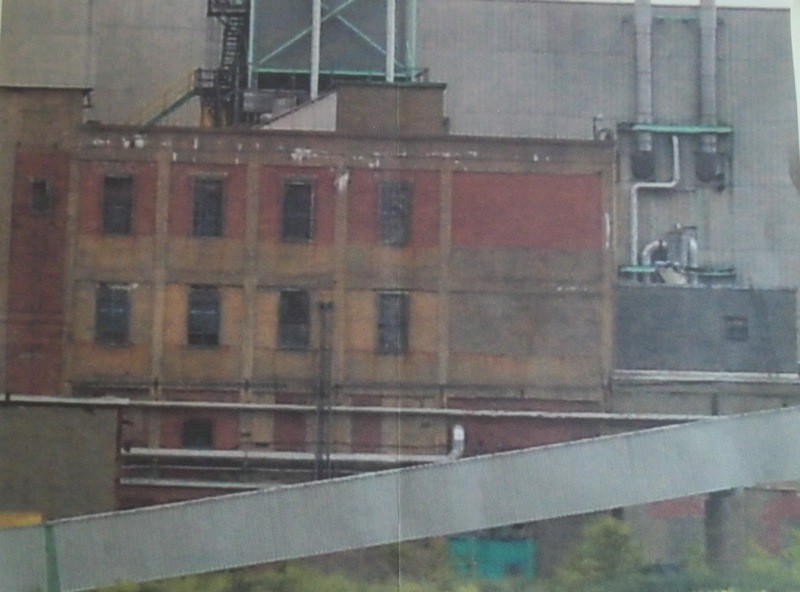 I started with a photograph of one view of the mill. I zeroed in on one interesting section which I then enlarged. I copied it to tracing paper with color notes. From there we made the paper pieceing sections. Yesterday I put these 2 together. I'll show more later. Today, I'm going to the pool for my swim and we'll see how I feel this afternoon. I've spent the last several days in a lethargic state due to a small medication adjustment. I'm very sensitive and it takes me a bit of time to get going again. I'm back today to as close to normal as I'm going to get. 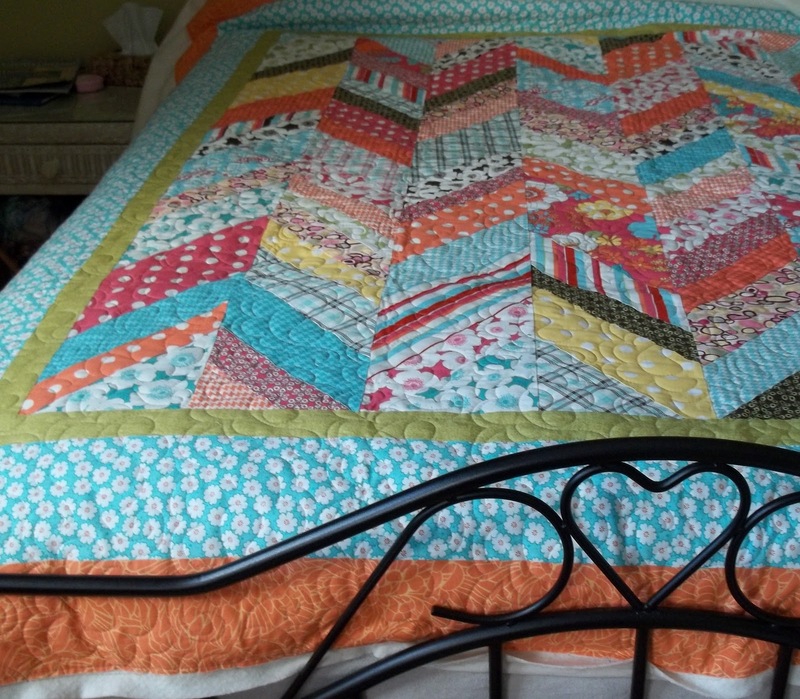 One thing that got me quite excited to day was that I got my orange zigzag quilt back from the machine quilter. 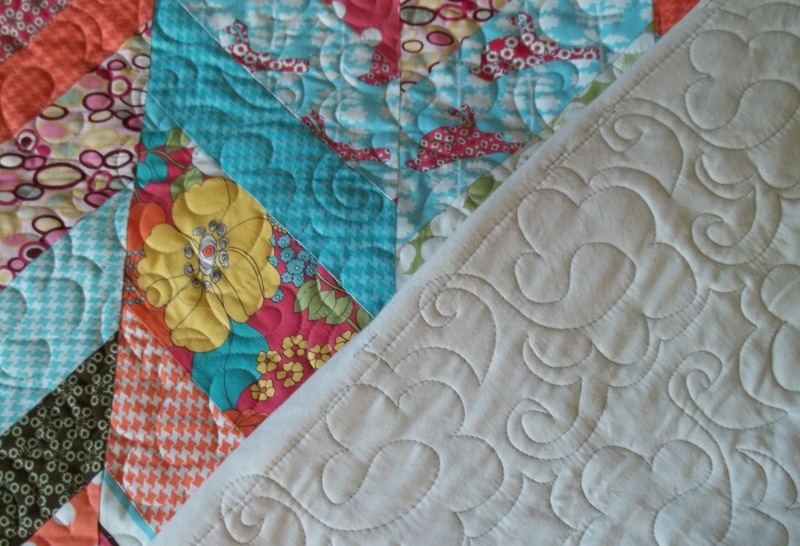 I love the pattern she used for the edge to edge quilting! Now I just have to cut and sew the binding which I haven't chosen yet. Anytime I come across something new (to me), I like to share. Recently, I read an article about the cancer causing chemicals that are present on the lining of microwave popcorn bags. 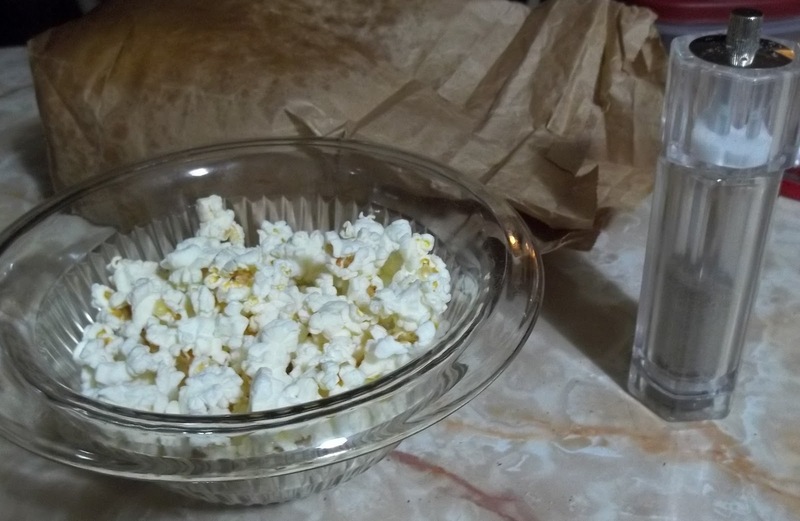 A suggestion for an alternative was to buy bulk popcorn kernels, add a small bit of olive oil, perhaps some salt, and put it into a regular brown bag to pop in the microwave. I had my doubts, as I could picture the bag opening and the popcorn going everywhere, but it did not and it popped perfectly. I simply folded the bag over a few times. I used to have a hot air popper but haven't found another one. This is a pretty good alternative, and it is cheaper than the store bought version too. 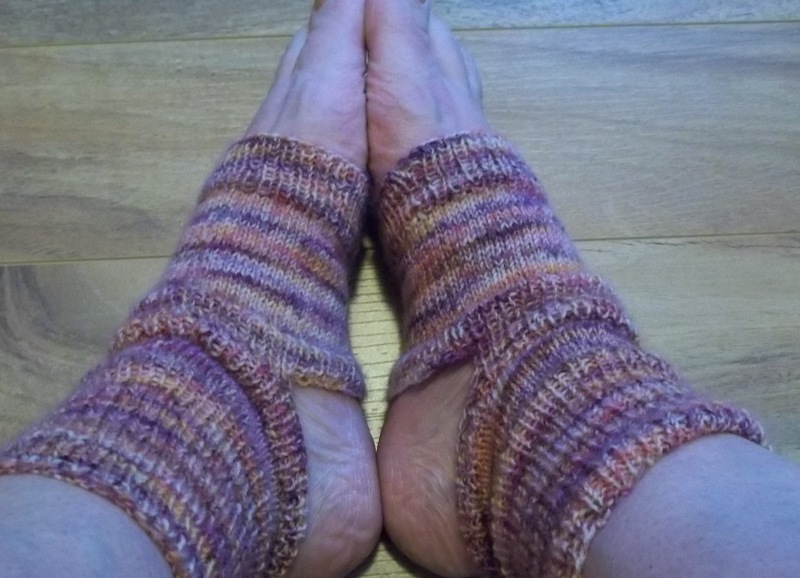 I'm almost finished my little truck hanging, but in the meantime I have finished knitting these yoga socks and tried them out a few times. They work very well. Now my husband wants a pair. some Kaffe Fassett fabric bits that I can use in my Cobblestones blocks. 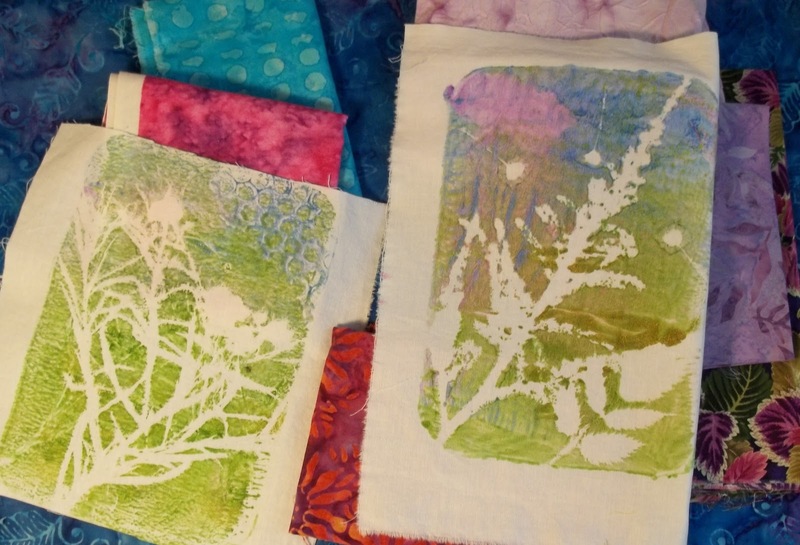 Quilters and artists are so generous! My swimming friend is back home after being away for a few weeks, so we went to the spa pool this morning. We haven't had lunch together for a while either. At the Auberge, there is a nice little restaurant where we ate and caught up on things. I usually have to rest up after ward which is why I have just a little bit to show today. 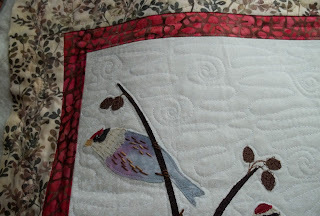 Here is a close up where I did some free motion quilting in black. There is more stitching to do, but at this point I need to let it rest, in order to allow the paint stick color that I applied to cure and to prevent smudging. It's just as well because I need to take a break and then get dinner started. It is to be a turnip and greens curry with basmati rice today. This morning a friend visited, and we sat at the computer and made a fabric order from Quilternity This is the link to the blog and her shop is on her sidebar. Then today after lunch, I went for a very short walk as my blood sugars were a little high. 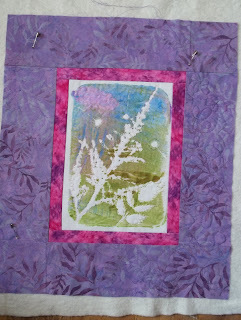 Afterward, I took a few minutes to get this little piece bordered and sandwiched for quilting. 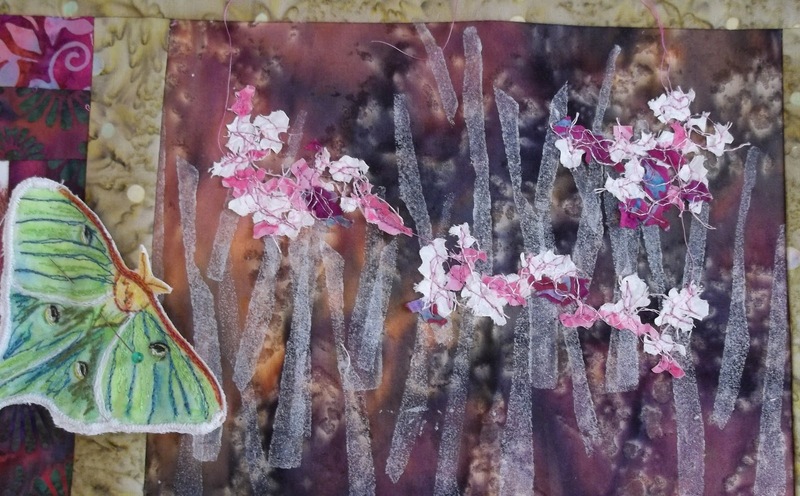 As I usual, I will be doing some embellishing. 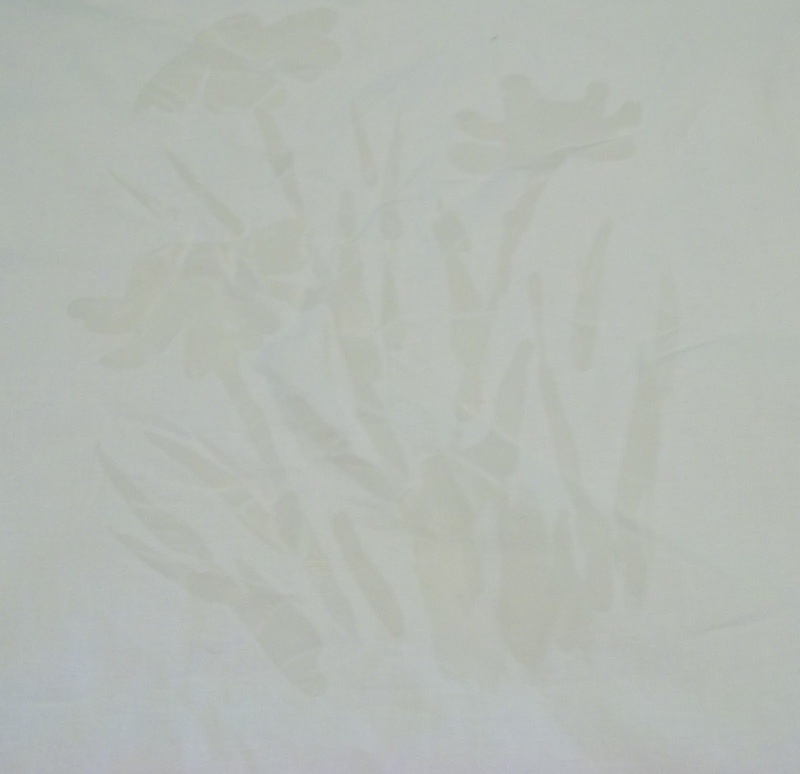 Also, I made up the second pillow in the gel printed pair. I think they're quite cheerful, just in time for spring! 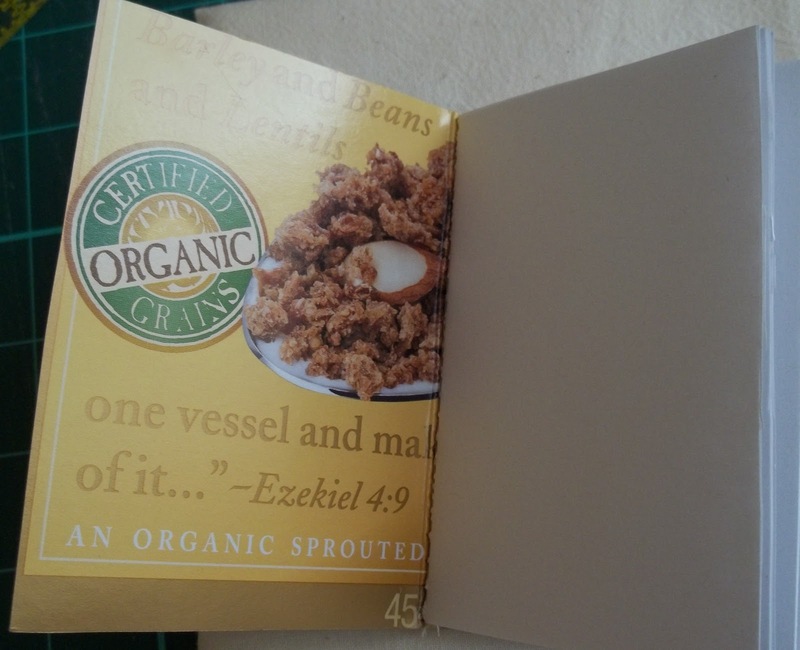 I was surfing blogs the other night and came across the directions for these little notebooks made form recycled food boxes and the inside of security envelopes (the blue deigned paper) here. I had to try one. I haven't embellished yet. Mine has copy paper inside and is about 4" by 5". It will end up tucked into someone's gift. I also haven't gotten around to posting pictures of my soy dyed pieces. 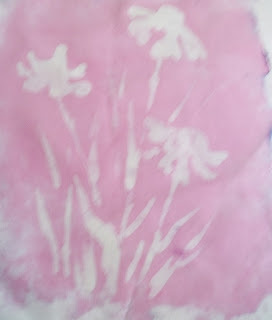 While they didn't come out as saturated as I'd hoped, I think I know why, and the method I used with the paper as a mask worked beautifully. I will have to order the proper thickener from a dye supply shop. Even though the dyes were quite old, I think that I just need to add more dye powder to the mix as well as use the proper thickener, sodium alginate. 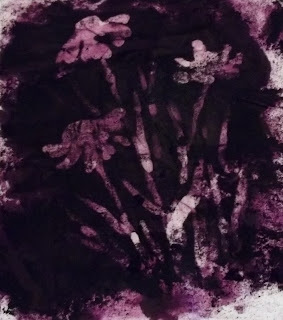 On this one I painted the flowers freehand with the wax. I got up this morning with no particular intentions other than a run to the market. I did that but still could not get the sushi that I wanted as the Korean lady was not there. I think I'm going to have to learn to make it myself. When I read an email from a friend that she had returned from a Florida trip and she was going to our UFO day I packed a little something to work on and went to the seniors room at the local arena. 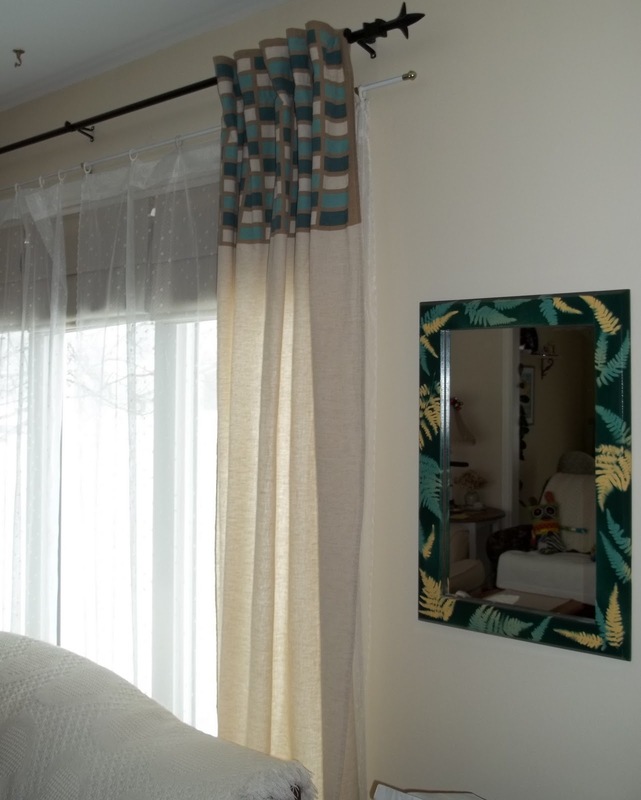 It was a warm sunny spring like day and the room has two sides of large windows--very uplifting. The chatter of friends and whir of the sewing machines just added to it. 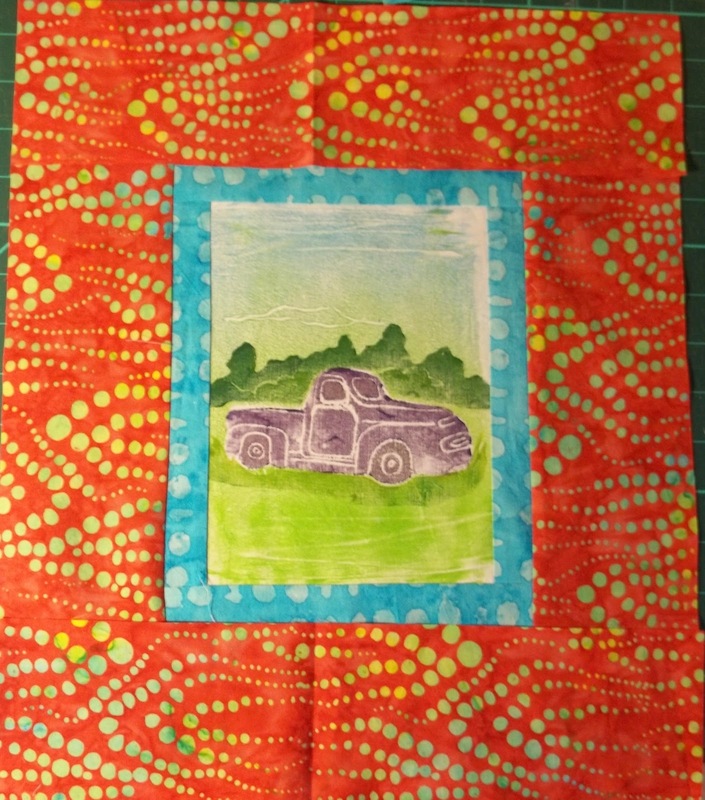 I did a few small things like cut borders for this gel print which I want to make into another pillow. 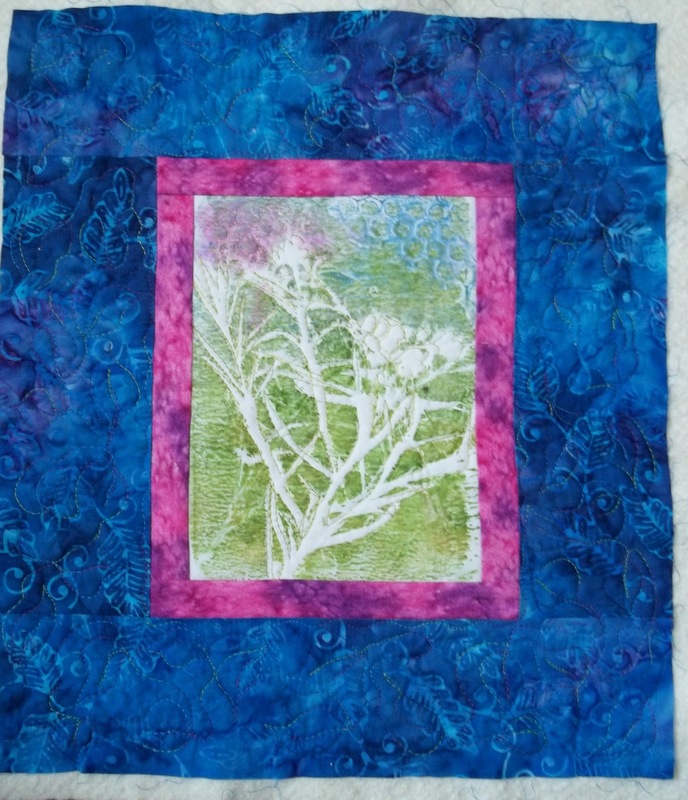 I can't wait to get to the quilting and embellishing. I'm planning some large, kind of mod flowers for it, if it goes as planned. I drew out a design for a new little project and stopped at Staples on the way home to enlarge it. I'll perhaps show it in the next couple of days. I left before 2pm because I haven't been out to walk in a few days and had told my husband I'd be home in time to go before supper. We had a nice walk; it sure felt like spring. Lately, I've been seeing these commercials on TV for the fish sandwich which I used to love to order instead of a burger at the fast food joint. I wouldn't order it now due to the fat content, but we decided to make a healthy version for supper to-night and it totally satisfied me. We did haddock dipped in a corn flake crust, baked at 425F for about 7 minutes. Before that we did oven fries. I added a home made yogurt based tartar sauce, and then a slice of cheddar cheese onto a fresh whole wheat bun. Wow, it was delicious! I was so tired, I fell asleep after supper and I'm pretty useless now. I'm just going to have a soak. Last but not least, I received this in the mail yesterday. 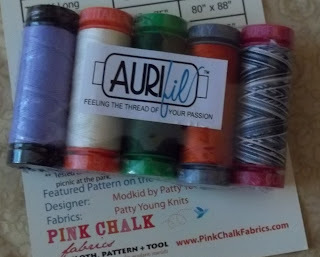 I couldn't believe it when I saw the email; I actually won a giveaway here on this blog. It was my first win and oh, so exciting. Yesterday, I decided that today would be the day to try some soy wax resists with dye rather than paint, as I've done before in the past. It doesn't matter how organized I think I am, I still manage to make a mess.I managed to clean most of it up except for the bits of stains left on my fingers, and yes, I did wear gloves. 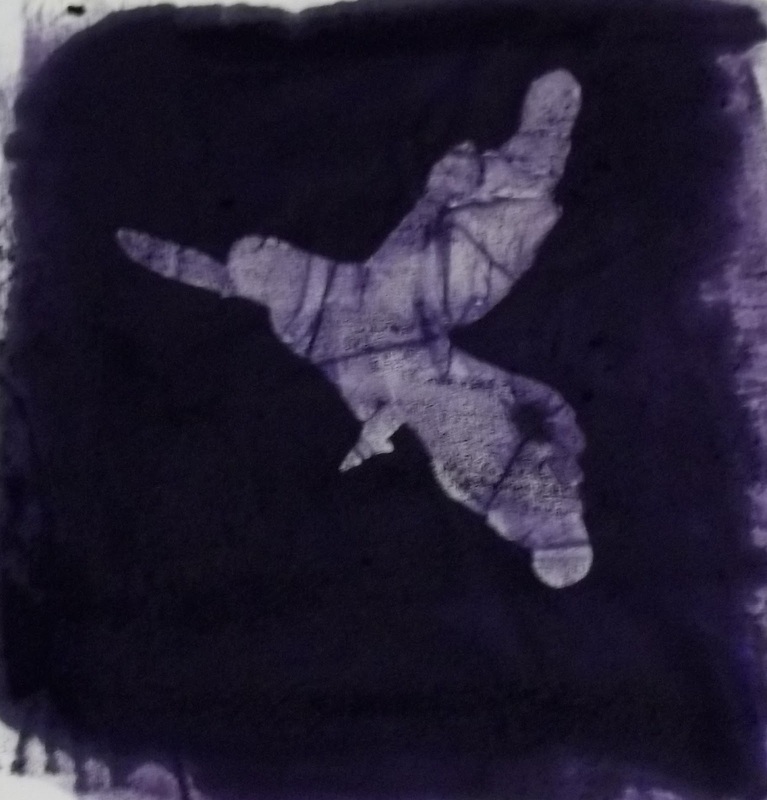 I had some rather old dyes left over from a workshop, but I'm told that I should use them anyway. I'm only experimenting at this point. I wanted to thicken the dyes, but can't buy the sodium alginate anywhere remotely near, so I tried agar which is similar. It sort of worked; I'm going to order the proper thickener though. 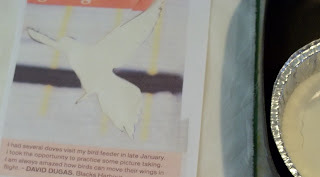 This was my first idea-- a dove shape cut out of paper. I painted the soy wax inside the paper frame. On this one ( you'll have to look closely to see the wax), I simple painted the flowers free hand with the wax. I'm not exactly sure how the dye will take. 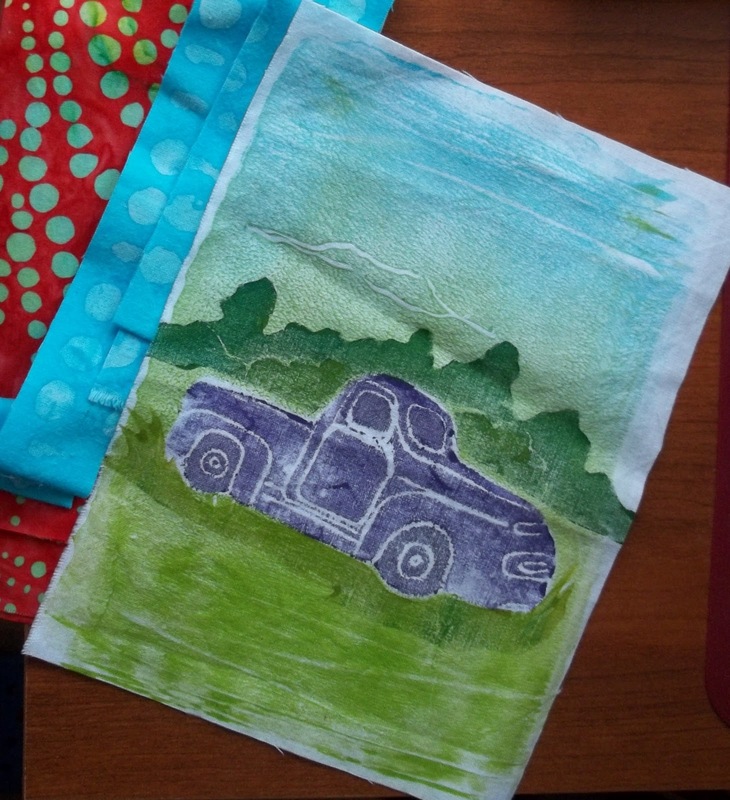 I did use soda soaked fabric. 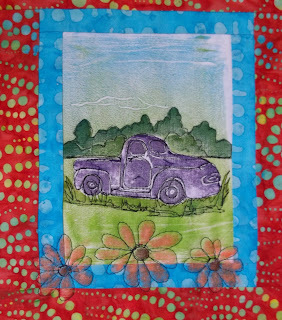 When I paint or do gel prints on fabric, I usually use more than one color and I can mix them as I go. Here I used only one color dye because I didn't want to mix more colors until I get the right thickener. The result might be very blah. We'll see. At least I'll have a better idea what to do next time. In the meant time I must wait. The hardest thing is that I have to leave them sit wrapped in plastic to 'batch'. I put out my first line of clothes since early January. 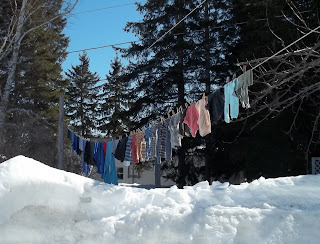 I often try to hang clothes most of the winter, but this year the snow got too high. Today, I was able to do socks, t-shirts and underwear and clear the snow. 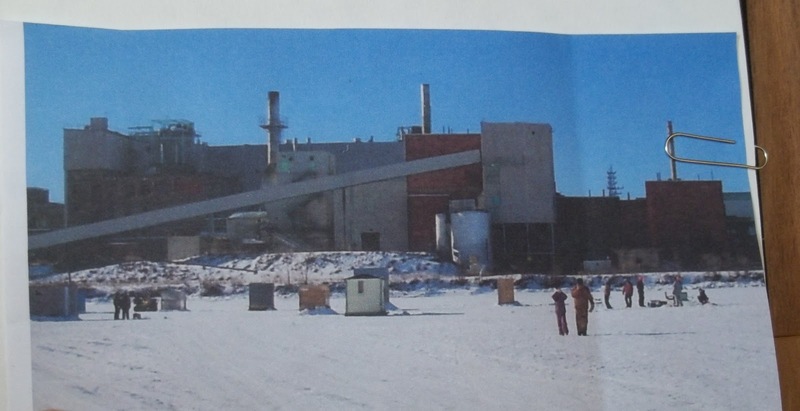 It was a beautiful blue skied day--temperature about -6C. I went for a short walk after lunch. It was too nice to stay inside. Our snow is still so deep that we took the opportunity last night ot go out and trim our apple tree while we can get at the top of it. 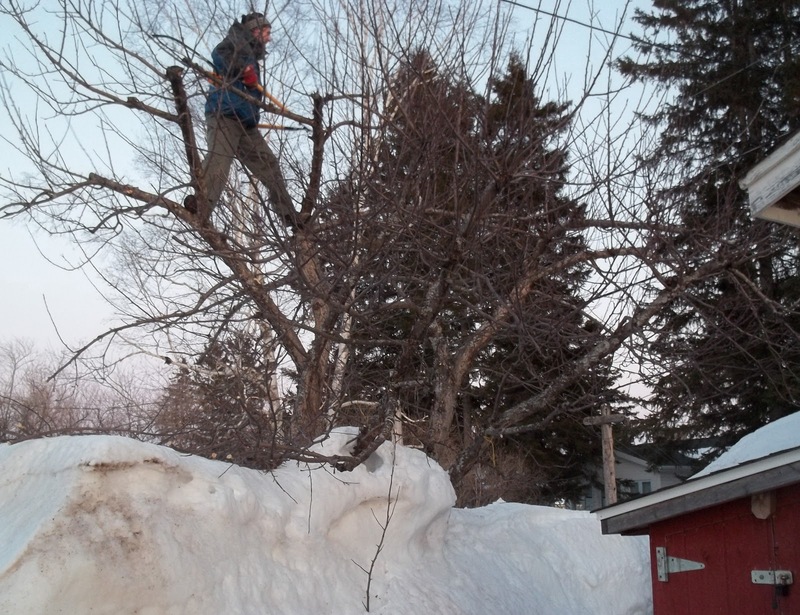 As you can see my husband was the one who climbed teh tree. I trimmed the lower branches and picked up. This afternoon after my walk, I put one cushion together. I'm quite pleased with it. It was a lovely spring like day today, about -8C and sunny. I didn't walk though; I went skating for 1/2 hour. I used to be a twice a week speed skater but I haven't been out in the last couple of years. I've been wanting to try the senior's skating all winter and just didn't feel strong enough. I've been out 3 times in the last couple of weeks on my old figure skates. I don't know why my legs shake so badly. I took it slowly for about a half hour. There are still a few weeks left so I'll get a little practice in before it ends. 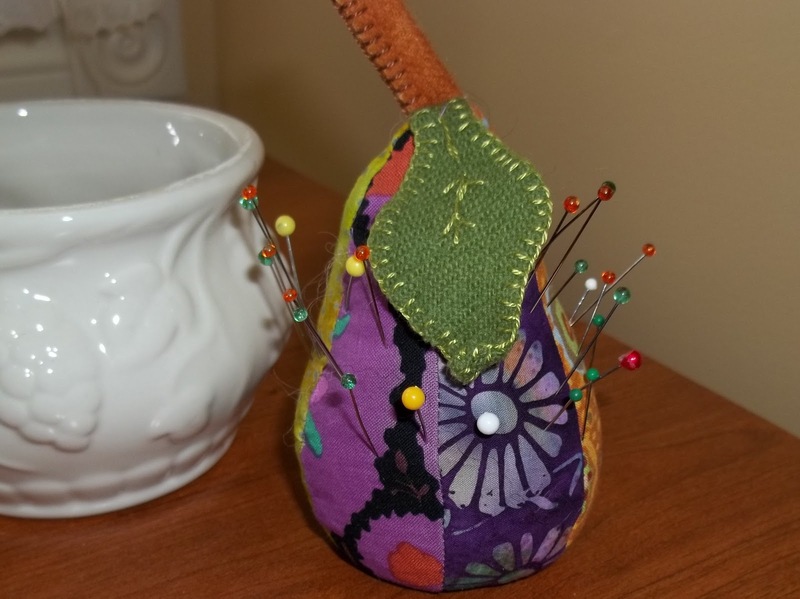 This afternoon I finished another little pear pin cushion. They are so bright and cheerful that they're addictive! 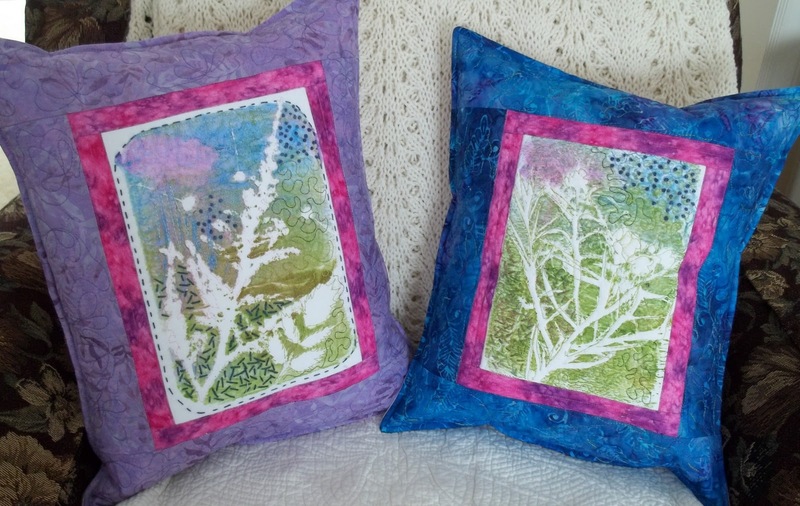 Originally when I started these prints, I thought I would quickly do a minimum of stitching to make pillows. 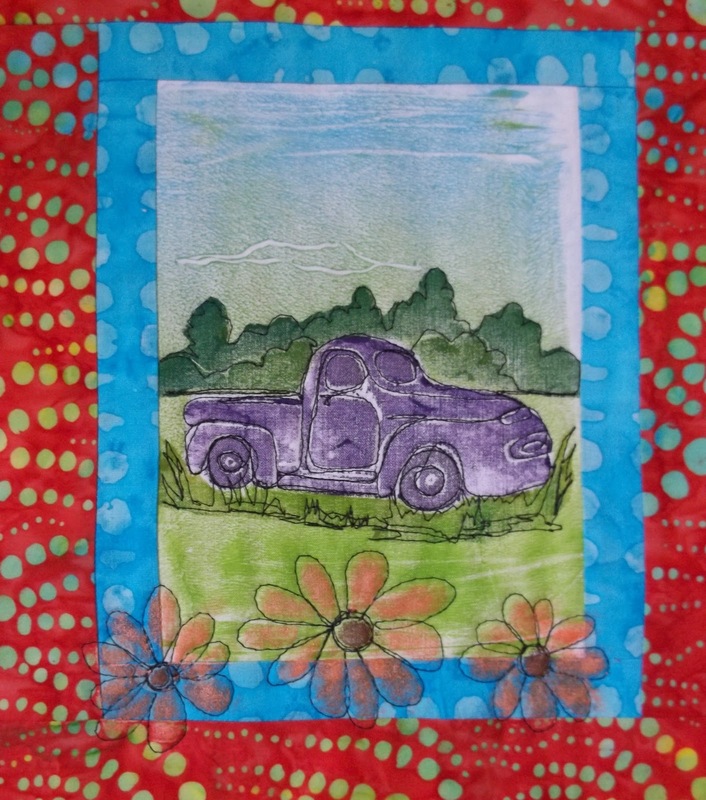 Then, yesterday, I decided that more machine quilting was needed. 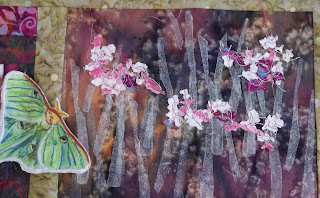 Once I got that done, today, I felt they needed hand embellishing which is what I really enjoy. 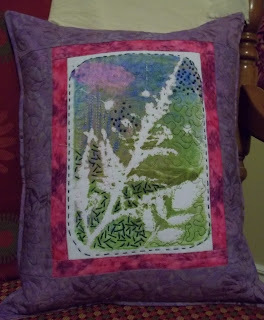 I finished the first one; it is ready to be sewn into a pillow. 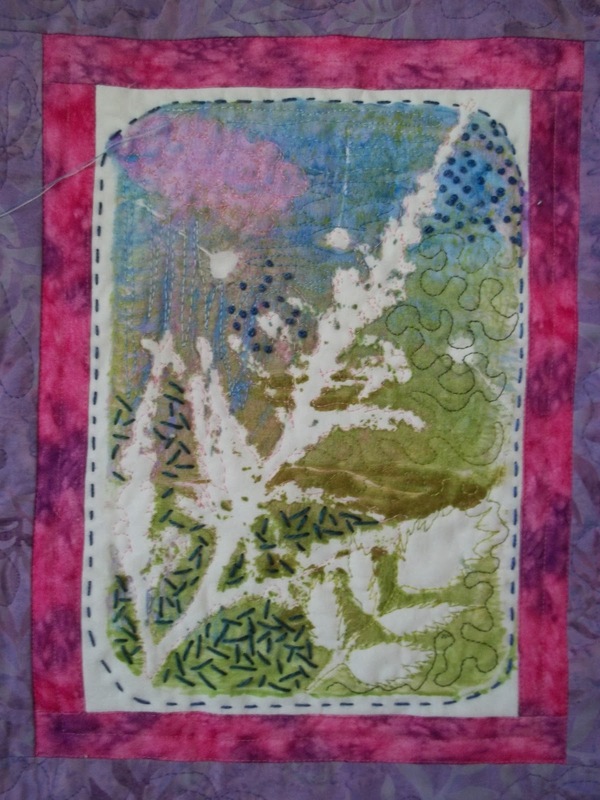 While I had the machine set for free motion, I stitched down the leaves to this project. 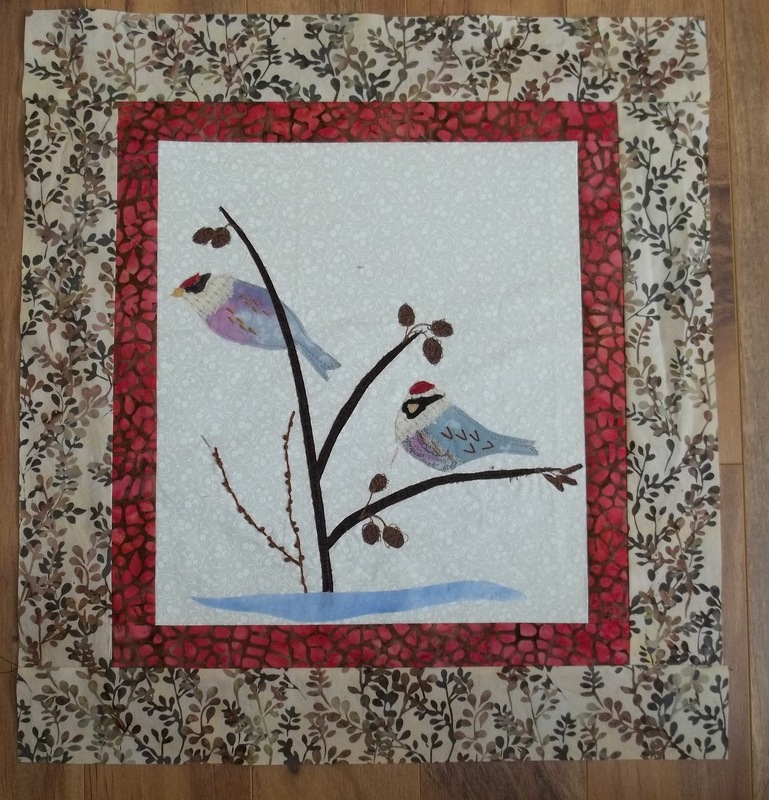 It's ready now to add the batting and get started on the quilting. 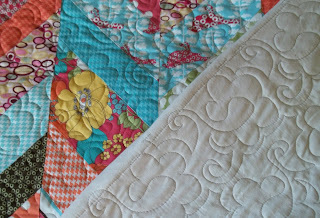 I've just finished most of the free motion quilting on these. I really could use lots more practice. My bobbin just ran out and it's a good time for me to stop and start cooking dinner--simple fare to-night-- fiddle heads from the freezer (need to use them up as it will soon be time for the fresh ones) steamed salmon tails and sweet potato. 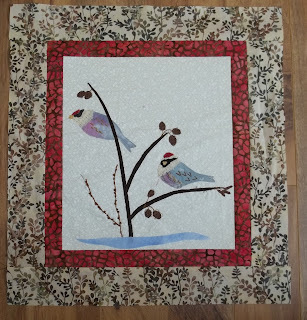 This afternoon, after having done errands, then an appointment at the bank, and lunch with friends, I finished the little bit of free motion quilting on the birds just before dinner time. While watching the news I did a little more embroidery on it. I'll take another picture once I finish. Today I made a vegetarian spaghetti sauce using TVP or textured vegetarian protein. Although I've made various versions of a vegetarian spaghetti, I've never tried it with the TVP. I started by sauteing onions, garlic and celery, and then added green and red peppers, zucchini and mushrooms. After about 10 minutes I added my spices and the sauce. The TVP requires about 5 minutes of soaking in hot water and then I added that to the sauce. It's served over regular whole wheat noodles, and we found found it to be really delicious. I froze the left over sauce. It may go into my version of vegetarian chili. 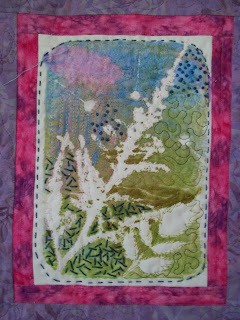 Just before supper, I started pulling out some fabrics to go with these gel prints that I did last summer. Since I'm planning to display at the waterfront craft shop this summer, I'm trying to get a few things ready. I think I'm going to sew these up into pillows and I will do only a small amount of machine quilting on them. I actually got the first borders on with the pink but now that I see it on the computer, I find the pink a little bright. I'll wait until tomorrow for a second look but I may take them off and go for the purple fabric. I do plan to addd a little more pink to part of the flowers though, so it might help. 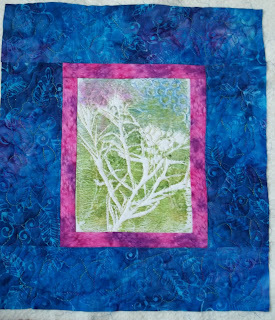 If you look carefully, you can see a smidgen of the blue batik that I will put on the outside and also the widest border. It has a bit of the purple color in it as well. On my way out the door this morning I found a parcel in my mailbox. It is my first one from my daughter who is teaching in Korea. There were all kinds of little goodies in it, including the beautiful pashmina you can see around the box. 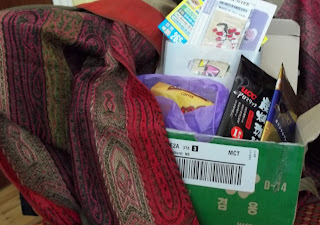 She included lots of things with Korean writing on them, so I can use them in my art work. There were some beaded bracelets, necklaces, tea, coffee, sticky notes, chocolate, and a couple of book marks from Vietnam where she spent Christmas. Fun! 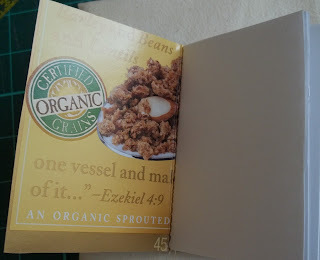 I might even have to scan and print the sides of the box which are quite interesting too. While reading an article in the most recent Canadian Living magazine about a family going green and making their own cleaning supplies and shampoos, I was inspired. It wasn't just the fact that I could make my own. I had also listened earlier in the week to a radio interview with Gillian Deacon, author of Green For Life, about the toxins that are in beauty supplies. I checked out the David Suzuki website and this video how to for directions on how to make the shampoo. After a quick trip to the health food store for supplies, I made it in about 10 minutes. 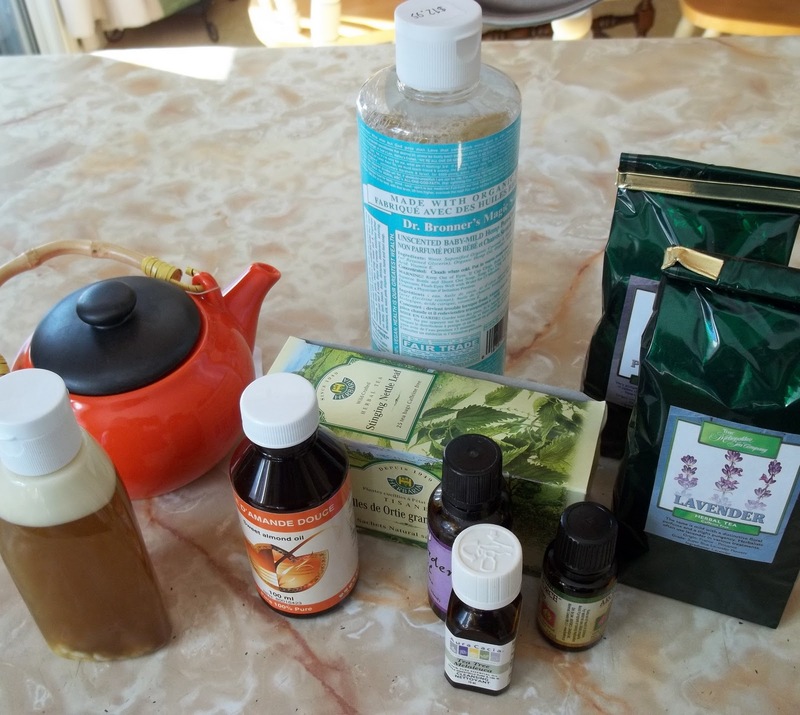 I spent about $45.00, although I already had a couple of the essential oils which are the most expensive items. I made a couple of small bottles but barely used any of the ingredients. It should last a long time. I tried it out last night and I really liked it. I will be able to experiment with the different essential oils for scent. This morning I did groceries and then went for a lunch at my friend Nicole's. We are fellow artists, so it's always inspiring to get together for a chat and some quick brainstorming about our projects. 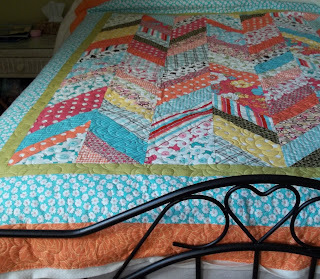 By the time I got home it was going on 3 PM, so I had time only to do a little free motion quilting on this. Spring is only just over a week away but it sure doesn't look it here. This is a view of my back door snow bank from the outside instead of from my doorway as I have been showing. Has this ever happened to anyone else? You have a vision for a project, but as you go along it doesn't seem to be going as you perhaps envisioned it, or if it is going that way you're not sure you like it? I do really like some things that I do, dislike others, and for some, I'm lukewarm. I think that's where I am with this piece. 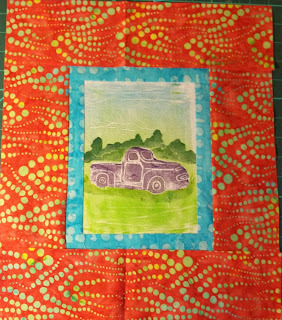 While I was away, I picked up the outside border fabric. It seemed to match the colors perfectly, although I'm not sure about it now. I do still have more details to add with the hand embroidery, but I wanted to see how it would look. 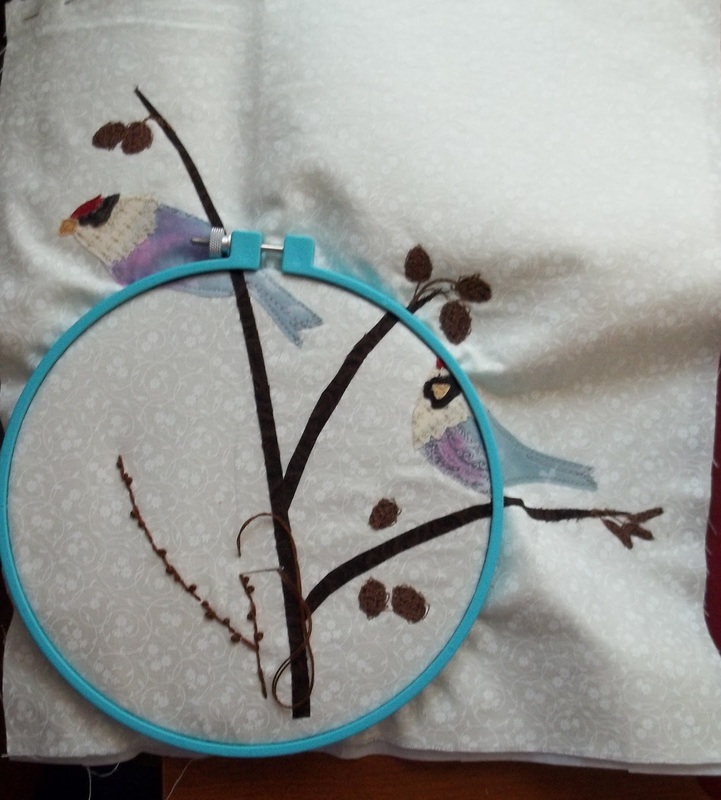 Also, once I finish the branch that I'm hand embroidering, I think I will machine quilt it before I finish the rest of the hand stitching. I haven't done the eyes or the feet yet either and maybe that's part of it. Probably, you're getting tired of the snow pictures, I know I am. This is what we got yesterday. I just heard on the radio that it was about 45cm. You can see if you care to look that the snow behind the deck is almost up to the roof of the shed. We had a very nice weekend--did some shopping for the important things on my list--and then some. My husband, son and my husband's brother went to the sports dome to hit golf balls. I went to Chapter's with the sister in law for tea and then we did some shopping. At the fabric shop I bought mostly batiks that I can use in my art quilts. 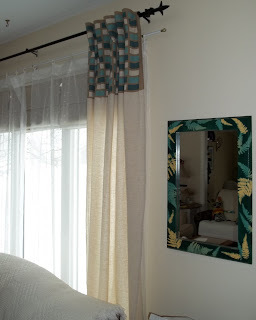 I picked up these curtains for half price at the Wicker Emporium. I meant them to go in my dining room but stuck them up in my living room window for now. We had a really nice supper with my son and his fiance on Saturday night at a place called the Zen Garden . I had a hot and sour soup with a stuffed dumpling. The others had the soup and then a bento box meal with assorted things like veggies, kimbap, and noodles. Usually we see them about twice a year because they live 6 hours away. It was a lovely idea to meet sort of halfway. We made plans for a camping vacation in the summer. Now, I 'm stuck home today in the midst of another huge snowstorm. I decided this might be a good time to try doing a fast. We have been getting into the yoga and I've been reading about it. On advice from one website I tried vegetable juice for the first time rather than water. It didn't go so well. I checked my sugars twice and by noon even after lots of water and juice it was too low, so I had steal cut oats with fruit around 1pm. I also was very dizzy and now I'm developing a terrible headaches,. I don't think fasting is the best thing for me with my adrenal and blood sugar problems. 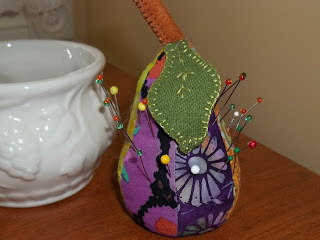 I did manage to keep busy by vacuuming early this morning and then I took the pear pin cushion apart and fixed that, but now I'm going to have to go stretch out with a book for a while. As i mentioned in the last post, we're heading out of town for the weekend. I'll be back Sunday. 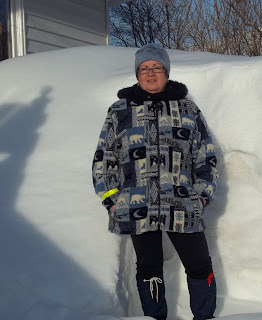 I did my errands today, as planned and came home to go snow shoeing with Gord who had taken the day off to do some things around the house. What a spectacular day it was. Temperatures warmed up to around 0C, which is a very comfortable winter climate for outdoor activities. 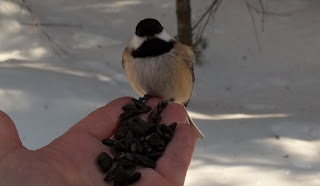 I have to show another chickadee feeding picture. They were all over today and I got lots. Usually they alight quickly like little dive bombers and take off equally fast but sometimes like today a few will sit and seem to be studying you. It s a very humbling and spiritual experience every time I feed them. In my mail today was this Koi watercolor kit that I ordered on sale. I had to quickly try it out. 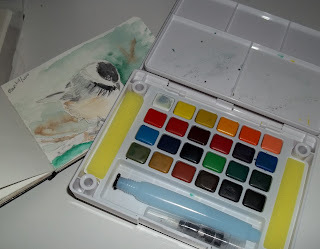 I can see that I must do a color chart to get better acquainted with all the colors and put it in the case for referrral. It's not a very good sketch as I was in too much of a hurry just before supper. Here's something funny I did yesterday. I put this pear together (pattern from retro mama) without rereading the directions. Does this sound familiar? When I stuffed it today , it seemed a little fat. Upon reading the directions, I discovered that I had sewn in 8 wedges instead of 6. My ADD strikes again. 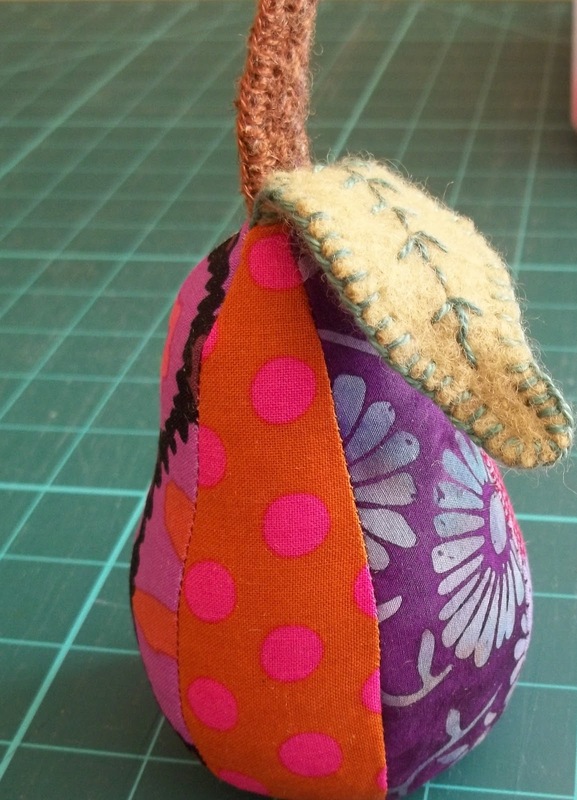 I was inclined to leave it at first, but I think I will redo it as i find it a little too plump. It bulges out too much at the bottom. I hope everyone has a great weekend! I'm heading out in while for a doctor's appointment, a couple of errands and lunch at the usual cafe with some friends. 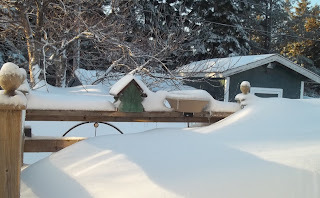 My husband also took the day off and this afternoon we may do some snowshoeing if it's warm enough. Tomorrow, we are driving the 2 hours to Moncton to meet my son and his girlfriend and will be back on Sunday. 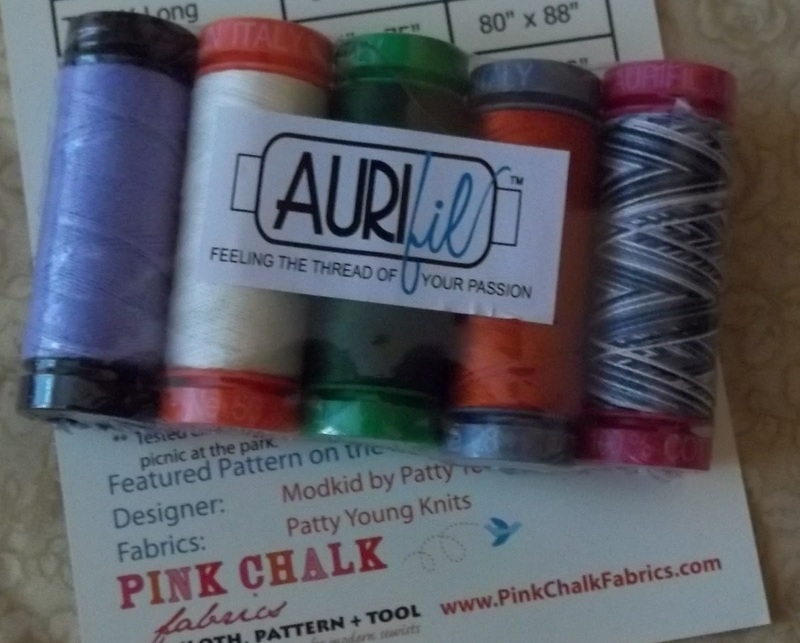 I'm hoping to get to a fabric store, Michaels and Chapters at least. Yesterday, my friend Nicole came for lunch and a little visit. Isn't it wonderful to get together with your creative friends? We are just so happy and the air just sparkles with ideas. About 10 minutes after she left, I noticed this little wool bird hanging from my shelf. She had sneaked it there when I wasn't looking. After she left, I free motion stitched on the appliqued birds, added a little paint for the rose color on the breast, and then I curled up with a Quilting Arts DVD and started the hand embellishing. The only thing I didn't finish machine stitching was the brown, as I have to wait until I go to Moncton tomorrow to get some brown thread. 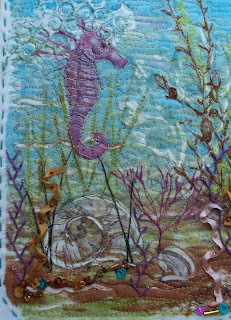 Finally, a fellow fiber artist expressed a wish to see my seahorse in a little more detail, so I tried to take another picture and crop it a little more. 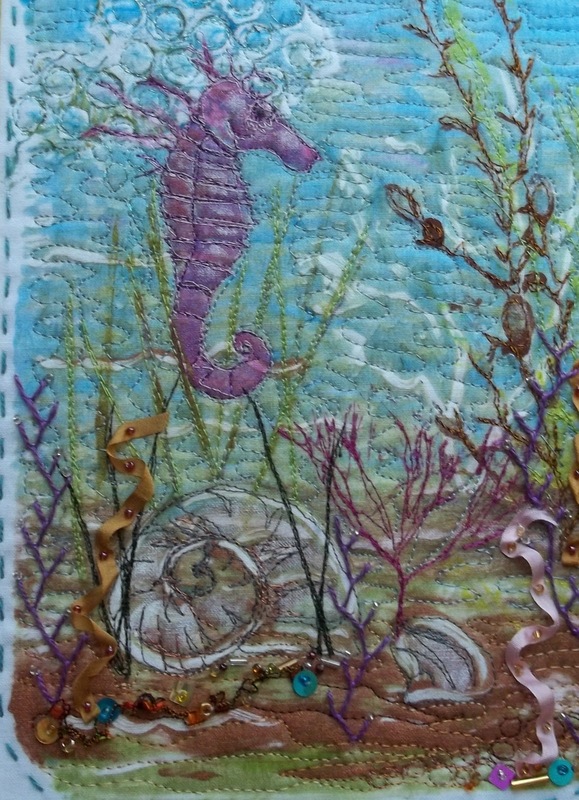 I think I mentioned before that it started with a gelatin print, then I stamped the seahorse with a foam stamp that I made. Also, some of the sea weed is printed form real dried seaweed. At that stage I back it with stabilizer, do some thread painting, then add the batting, quilt it and embellish in the final step. 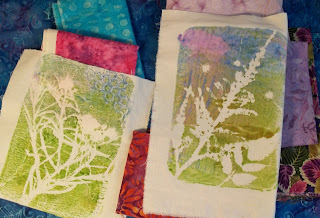 I had 3 appointments today all spaced out over the course of the day, but luckily, none took too long, and I had some time to play some in my studio. I got home from my first appointment at the hospital before 8AM, so I even had a much needed little chat with my daughter in Korea. She is suffering from a rather nasty case of tonsillitis right now, which she's never had before. Luckily, she had yesterday off but must go in to teach a new bunch of classes tomorrow. I got my little bit of token cleaning done too. I spritzed and mopped some of the hardwood in the living room and then I was free to spend a little time in my studio. 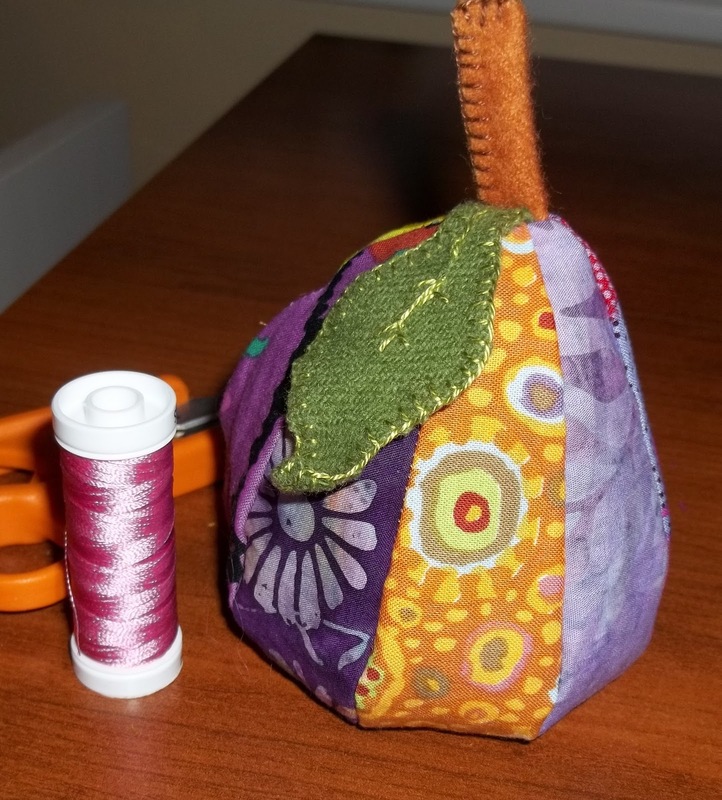 After cutting and organizing some more Kaffe Fassett fabrics, I got down to cutting out the pieces for my little bird hanging. Here you see them laid out approximately; they are not yet ironed down. I still may make the odd adjustment. 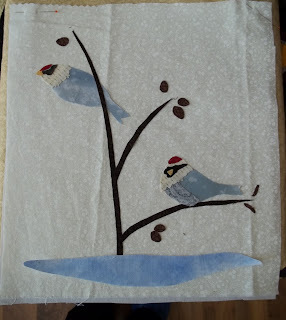 Once sewn down, I will then add some hand embroidery and a little paint as well. It is satisfying to get something out of my head and my sketchbook into fabric. I've been planning it out in my head and finally had the time to do it.